The Yellowfin Flasher Wrasse, Paracheilinus flavianalis, is a peaceful, and colorful addition to the reef aquarium. As with many animals in nature, the brilliant colors of the male yellowfin flasher outshine the more subdued appearance of the female. Color variation in this species has been reported to be based on the locale of collection, age, and the fish’s mood. Most adult males are bright red in color, brilliant blue stripes, and of course a dorsal fin which can change in color to yellow during the courting period. Indigenous to Indonesia, this carnivore can be found at depths ranging from shallow waters, to over a 100 ft. In the reef aquarium, please provide the Yellowfin Flasher Wrasse with sufficient rockwork, arranged in such a way as to provide ample hiding spots. Several females may be kept with one male, providing that they are introduced at the same time. Another option it to add the females to the tank first, and then the male. As with many other wrasses, this species likes to jump, and therefore a lid, or in reef tanks, a screen top is highly recommended. Diet should consist of frozen mysis shrimp, brine shrimp and other meaty food. It is a good idea to enrich the food with vitamins. 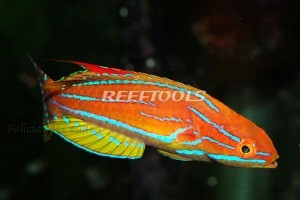 The yellowfin flasher wrasse should be fed several times per day.